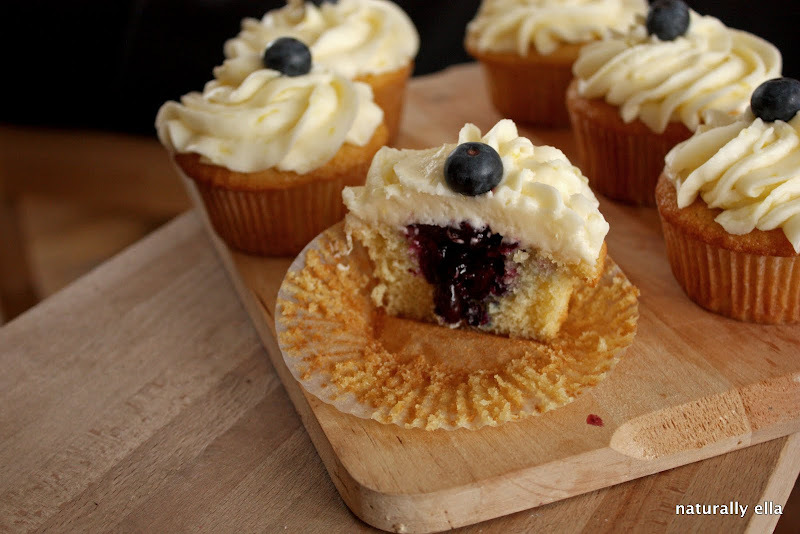 Blueberry and lemon cupcakes- the perfect birthday cake | Naturally. Mike whisked me away for my birthday surprise of two days full of wonderful meals, good times with friends, and a little more wine than I probably should have. The only thing missing? My birthday cake. I mean, you can’t let a birthday pass and not have cake, right? That is the one time of the year when you can stuff your face full of cake and really not feel guilty! So, when Mike and I returned, I hauled out my mixer and made myself cupcakes. Hey, sometimes a girl has to do what she has to do! I’m still not sure what made me choose blueberry filled vanilla cupcakes with lemon buttercream, but they were delicious. I think it may be the fact that along with too much wine, I think I ate too much chocolate. At least I got my cake- even if I did have to make it! To make blueberry filling, place blueberries in a small saucepan and heat over medium heat. Let heat until juice begin to extract from blueberries and fill the bottom of the pan. Stir frequently, add in sugar and cornstarch. The sauce will begin to thicken and if should be consistency of pudding (the sauce will thicken as it cools.) If the sauce is too thick before cooling, add a spoonful of sugar. Scrap into a separate bowl and set aside to cool. In a small bowl, sift dry ingredients and set aside. In a medium bowl (or a bowl of a stand mixer) combine butter and sugar, beat until light and fluffy- about 3 minutes. Add in egg and vanilla, continue to beat until incorporated. Add 1/3 of the dry ingredients followed by half of the milk. Beat until just combined. Scrap down sides and repeat. Add remaining flour and mix until batter is combined- don’t over mix. Divide batter into 12 cupcakes and bake for 18-20 minutes or until cupcake springs back when pressed. Remove from pan and let cool. Swirl with frosting as desired! well, happy belated birthday to ya! Oh geez! Today was one of those days that I would have forgotten my head if it wasn’t attached (I even forgot my instrument for rehearsal!) I updated the recipe- hope you enjoy! What a great idea to put blueberry sauce inside. it looks fantastic. Happy birthday! I just made a blueberry cupcake myself! Don’t worry, I always make my own birthday cake. Hey, I’m gonna make these today for a party and was wondering: in the blueberry sauce recipe, you call for a 1/4 cup of sugar but in the directions say to add “the flour and cornstarch”. Do I add sugar there, or am I using 1/4 cup flour and not sugar? Sorry for the confusion- my mind thinks one thing and I type another! The ingredient is sugar, not flour! They look great. Do you think they would work just as well with raspberries? I have frozen raspberries in the freezer and would love to try these. Yes I do. I thought about raspberries myself but I happen to have blueberries on hand! hi, I was wondering if this was a high altitude recipe? Do you know how long these cupcakes keep? I would love to make them, they sound divine, but need to make them ahead. Do you have a recommendation? Should they be refrigerated? I’m honestly not sure- I would say 2-3 days keeping them in an airtight container, not in the refrigerator. Hope that helps! How long would the filling keep in the fridge? this sounds really cool. thinking about making these for a tiki party, but do I have to make lemon buttercream frosting? Sorry for the delayed response! In short, no! You can use whatever type of frosting/flavor your want! After making the blueberry filling, I noticed there wasn’t much flavor. I let it cool more and tasted it again. This time it was sweeter and lovely. Is there a reason for the difference in taste due to temperature? I just made these for a coworker’s birthday today and followed the recipe exactly. They turned out perfectly delicious and beautiful! 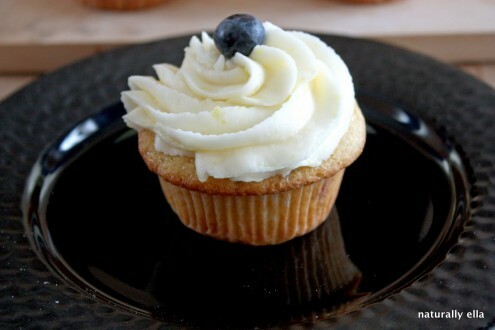 The cupcakes are fluffy and moist and the blueberry filling cuts through the sweetness of the frosting and cupcakes. I will make again!! Thank you!